Kimura-san's most amazing vegetables always attract a crowd! I work part-time at Nippori Marche and thought I'd talk a bit about what it takes to help run a (small) market one weekend a month in Tokyo. As Joan points out in her fabulous monthly listing of events and farmers markets, this is a lively event with a focus on good food and fresh fruit and vegetables. 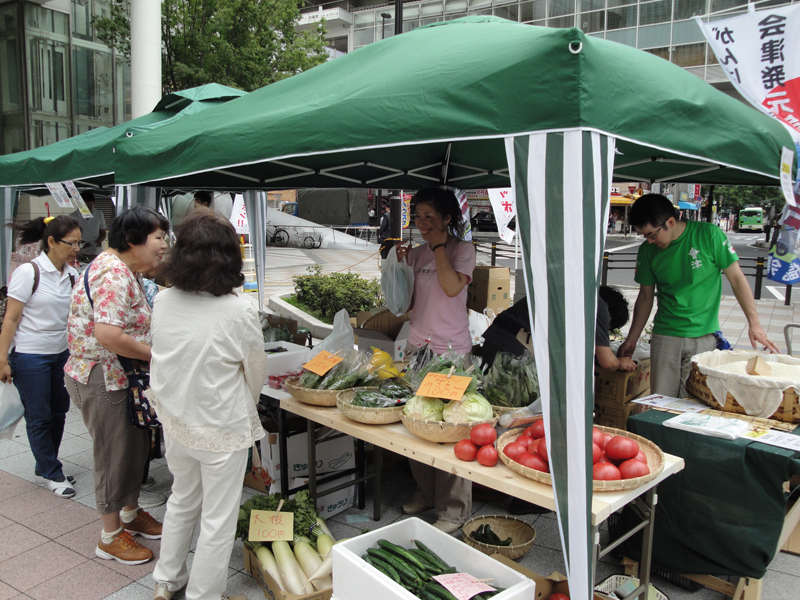 It all started six years ago, when the good people who own the event square in Nippori joined up with Arakawa-ku and decided that they wanted to create opportunities for farmers to meet their customers directly, in a city that doesn't have a lot of event squares with available space for this kind of activity. It really started from scratch and we have never cancelled a single day, rain, snow or shine. In fact, I think “shine” is the worst, when it is 36 C or more in the sun. Typhoons do cause some trouble too for an outdoor market like ours! Sase-san's bountiful harvest is worth a good long look, and he's always up for a chat. We meet up on the Friday before the weekend to bring the green tents and tables and other equipment to the event square. Stuff like sinks and running water, as well as fire extinguishers, are required by law, and we also provide a PA system for music and a stage for performances. The tents are really heavy but still tend to lift and take off with strong gusts of wind, so we have to bring heavy concrete blocks to secure all the tent poles, and yikes, they ARE heavy! Flags and ads also add to the fun. Many vendors bring their own flags to decorate their booths, but we like to have a sense of unity so that people can see that the market is “on” as they exit the JR Nippori station. The vendors arrive early Saturday morning, some from quite a distance. 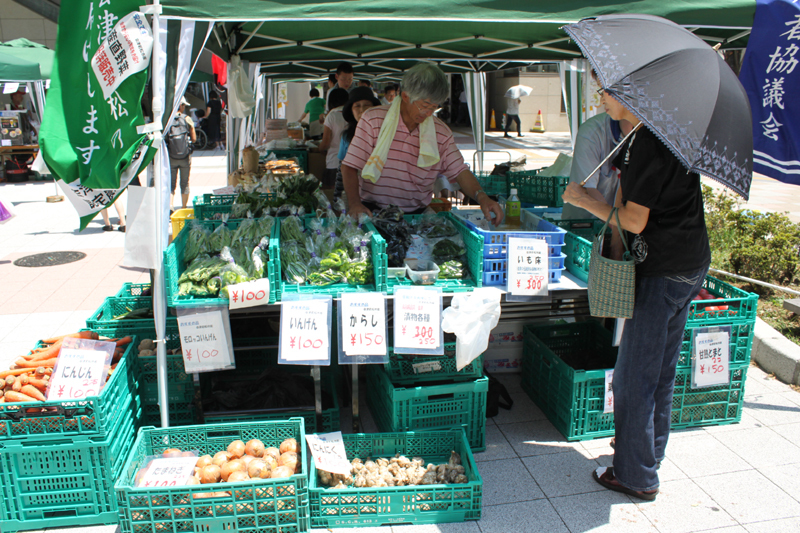 Sase-san and Kimura-san drive all the way from Aizu Wakamatsu in Fukushima prefecture, and their fresh produce is always incredibly popular. We have vendors selling fruit from Aomori, including apples. Look out for Sameshima-san who sells food shipped from Tanegashima, the tiny island south of Kagoshima. 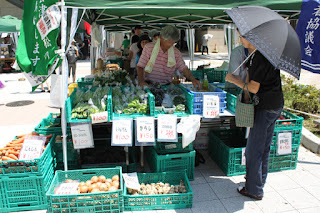 Several people bring just harvested veggies and pickles and organic food from Chiba and Miyagi. Gyoza from Utsunomiya. 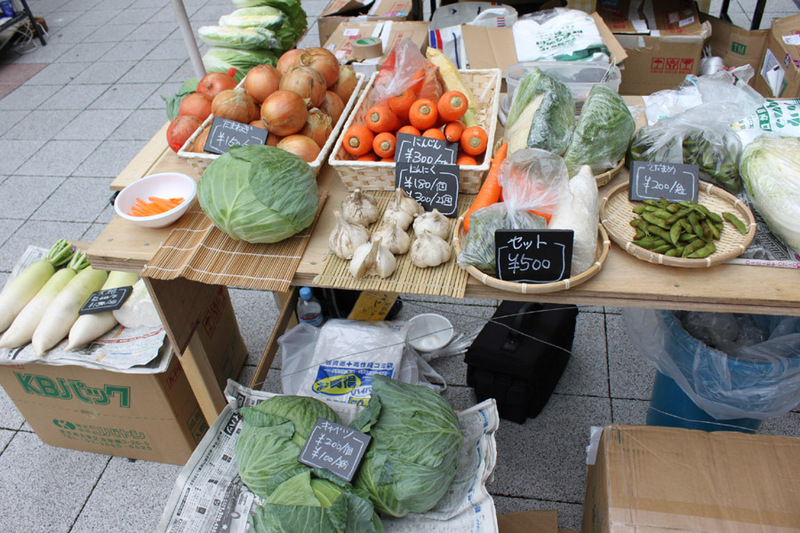 Food from Chichibu in rural Saitama is brought in, depending on the season. Homemade honey and delicious olive oil also to be sampled and brought home, maybe as a present for someone special? We are pretty international: I highly recommend sampling Richard's fine French pastries and quiche & pies that he makes himself, and you can feast on Brazilian dishes, as well as fried samosa and Pakistani food. 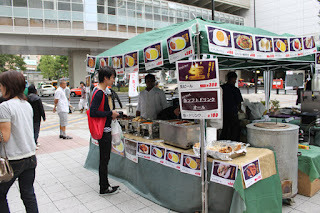 Many people come back each month for the yakisoba and dumplings. Soft drinks, beer, nihonshu (sake) and more will be served, plus the best coffee in town from Ethiopia! Oh, and in summer, do head to Nippori to satisfy your sweet tooth craving of kakigori, the traditional shaved ice with different syrups, so beloved by kids all over Japan. At dusk, we decide if we will close at 5 pm or maybe put up lamps and carry on an hour longer, depending on the weather and the mood. The stage performances continue until we close, with dance by Sanchome, solo guitar by Hitori Ventures, and all kinds of local talents, including a team of guys with mad basketball skills... From around lunch time we set up tables so people can enjoy their food and drinks – we jokingly call it the Nippori Marche Beer Garden, although that is not entirely official. We have been featured on TV and in Tokyo Walker, but we could really need some major PR. Do visit and share with your friends. Then the hard work begins to take everything down. Many vendors join in to help and it is pretty smooth going by now. On a good evening it takes less than an hour to dismantle the entire market, tent by tent, table by table, booth by booth, sink by sink, flag by flag. Sometimes, we go for karaoke or head to the nearest izakaya to relax together. In summer, we party right there at the event square, so don't be surprised if you should happen to see a bunch of tired but happy people sitting outside on the event square in a rather un-Japanese fashion, late into the evening. July 16-17 (Sat – Sun) will mark the 70th event so far!